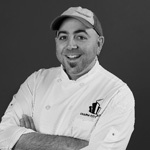 Turns out UMBC alumnus-turned-celebrity-chef Jeffrey “Duff” Goldman ’97, history, is not just a stellar cake baker, but also an auto enthusiast. In an interview with MotorTrend.com, the “Ace of Cakes” star talks about his lifelong love for all things car. Read the full story in Motor Trend here. Goldman, who most recently created a six-tier cake for President Obama’s inauguration, was named an Outstanding Alumnus of the Year by UMBC in 2009. Congratulations to the Class of 2013!